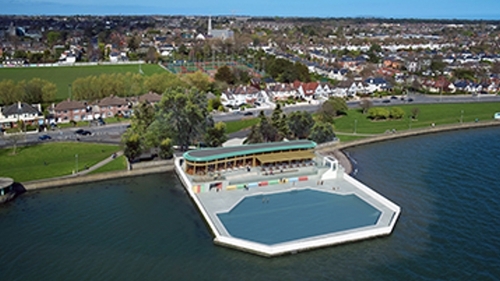 The 132-year-old Clontarf Seawater Baths in Dublin will open to the public next week. It follows the granting of a full seven-day publican's licence by Judge Doirbhile Flanagan in the Circuit Civil Court. Publican and hotelier David Cullen was in court to hear the finalisation of his 25-year-long dream to re-open the baths. The development consists of an open seawater swimming pool, bar and restaurants. Mr Cullen, of Seafield Hotel, Ballymoney, Gorey, Co Wexford, owns the Clontarf Baths and Assembly Rooms Company. It has spent €2.4m in a major redevelopment scheme. His barrister Dorothy Collins said that 33 staff had been recruited, who were undergoing on-site training in anticipation of next week's opening. Earlier, the court was told that the company had reconstructed and refurbished open-air seawater baths that had existed on the site since 1886 and which would use filtered water from Dublin Bay. Ms Collins said the development provided a fully modernised swimming pool for members of the public and would serve all of the city of Dublin and even parts of Co Wicklow as the DART ran close to it. In order for a new development to be granted a pub licence and existing one has to be extinguished and Mr Cullen, who owns the Seafield Hotel and Spa Resort in Co Wexford, and the Turk's Head in Dublin, bought out the licence formerly attaching to Browns Bar on the Naas Road, Co Dublin, for €60,000.